There are 10-mile stretches of L.A. highway that can take over an hour to commute. With a growing population of 4 million people, all living and working within one of the world's most economically powerful cities, it's time Los Angeles solved its gridlock problem. Recently, the MTA announced plans to reduce commute times by 15% - unfortunately, this plan will not arrive before the year 2057. Today, a one-way commute from Burbank to LAX in morning traffic takes roughly 1 hour 15 minutes - by comparison, that same trip in 40 years time will take roughly 1 hour 4 minutes. In other words, with an aggressive (and cost efficient) approach, we can do much better. The Bridge is a elevated rail-bus system above the freeways of L.A. Traveling at speeds of 95 mph, a person would be able to walk onto the Bridge in Burbank and step off at LAX in roughly 20 minutes. No matter the time of day. No matter the traffic. It is inspiring to imagine what Los Angeles could look and feel like 100 years from now - especially when looking back at L.A. in the early 20s - so much is possible in the next century. My name is Mike Ambs - I am not a civil engineer, nor am I involved in any capacity with MTA - I am simply a citizen of Los Angeles with an idea to address our record-breaking gridlock. I have put together the following research, findings, models, and routes in my own time, and moving forward I hope to work with others to see this dream become a reality. I am proposing this transit project because L.A. is unique in its resources, its challenges, and because, with a more future-minded approach, gridlock could be a distance memory for this city, something only seen in old photographs and footage. The Bridge is designed to be unique, to leave an imprint on the face of Los Angeles recognizable around the world. The approach is a fast-moving platform (rather than an improved traditional bus), making The Bridge efficient in terms of passenger capacity and speed, as well as highly expandable over the coming decades. The Bridge would become a must-see for 47.3 million (and growing) tourists that visit from around the world each year, encouraging more visitors to rely on the future-minded high-speed transit system (rather than renting their own vehicle and further adding to the pressure felt by our overwhelmed freeways). Dedicated ROW railways above LA freeways. 100% Electric, Power Provided by Central Rails. Quiet. Contained rubber-wheels ride along fiber guides. High Passenger Capacity (275 per Bridge car). High-Speed, ie, Fastest Mode of Transit, even when compared to driving in a vehicle free of congestion. Builds off of existing Metro transit systems. Traditional transit solutions have fallen short in Los Angeles for a simple reason, L.A. is a uniquely massive and sprawling city - the cities of St. Louis, Cleveland, San Francisco, Manhattan, Boston, Detroit, and Pittsburgh could all fit within the limits of Los Angeles with room to spare. Whereas dedicated rapid bus lines and subway systems work well in connecting other major cities end-to-end, for L.A. these approaches have simply not been fast enough for many residents and will continue to not be fast enough into the coming decades. $9.7 billion is wasted on time & fuel each year in LA traffic. To put that statistic in perspective, all 135 miles of the proposed Bridge system could be constructed for roughly $3 billion, an investment that would fundamentally change public transit in Los Angeles for the next 100 years. The Bridge would not only change the way residents and tourists alike moved about the city, it would unlock billions in potential economic activity. Comparing the most common forms of public transit in terms of their CPM (Cost Per Mile) and their MPH. The Bridge cost in the neighborhood of 25 Million Per Mile, comparable to ROW (Right of Way) rapid bus lines, except it would be (easily) capable of averaging speeds of over 90 MPH within the city. Side-by-side comparisons shows that The Bridge is by far the more cost-efficient option when looking at how far each dollar spent on transit goes towards quickly moving people around the city. The Orange Line Metro cost 20 Million per mile, with an average speed of 18 MPH. The Gold Line cost nearly 70 million per mile, with an average speed of 22 MPH. The Red Line Metro cost 265 Million Per Mile, with an average speed of 20 MPH. * Commute time is calculated for a one-way 18 mile trip. With 2x Bridge cars (one traveling north, one traveling south) arriving every roughly 10 minutes, there is a daily ridership capacity of roughly 280,500 people each day (running on the MTA hours of operation, 5am - midnight). Clearly, it would not be feasible to build a solid 2nd tier of roadway above the existing and heavily trafficked freeways of LA - however, it is feasible to install a rail system along the divider and edges of our freeways, and to do so with minimal construction impact. This rail system, reaching 30-60 ft above the road, would create 2/3rds of an arch, an arch that is structurally completed when the Bridge car passes over the rail. The Bridge car acts as the crown (load support), with the rail system acting as a hinged abutments. Based off recent census and traffic-flow data, the Bridge system is 5 interconnecting lines which span a total of 135 miles, making the most of existing freeways, and connecting two of Los Angeles' main hubs, LAX and Union Station, via an 14 minute trip. Beyond connecting several high-populated and high-trafficked areas of the city, The Bridge directly links two of L.A.'s main hubs. 80.9 million passengers travel through LAX each year. LAX continues to set records each year for travelers - and with a 2006 cap soon expiring, the world famous airport could be looking at nearly 100 million passengers annually in the coming decades. 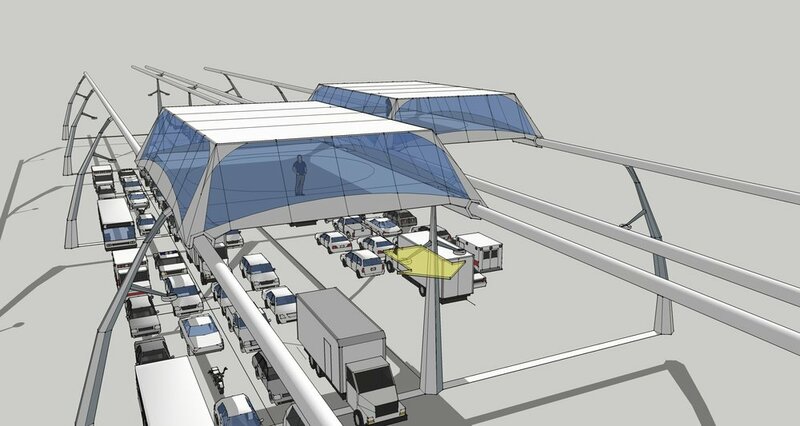 A proposed people mover would indeed help ease pressure within the airport loop itself, but this would have zero effect on the congestion felt by surface streets and surrounding freeways. 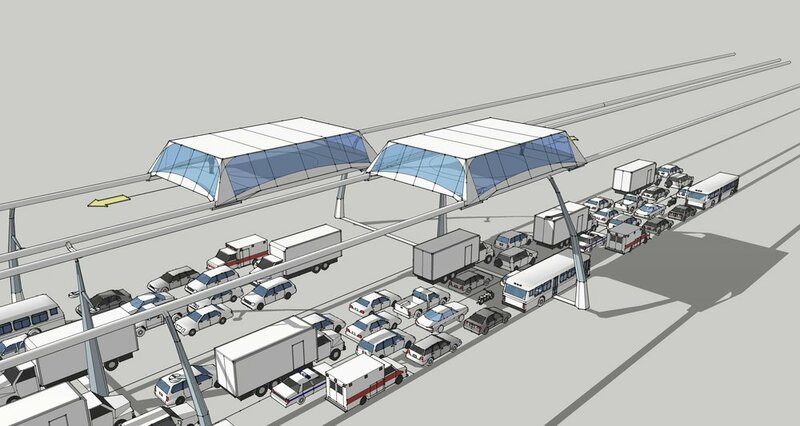 The Bridge is designed to travel directly through the airport loop, providing a direct line from gate to downtown, resulting in several thousand fewer people driving to and from the airport each day. 1.5 million passengers travel through Union Station each year. With talk of the HDC project including a bullet-train running from Vegas to Union, the historic terminal could see a high increase in passengers over the coming decades. Imagine traveling on a high-speed train from Vegas to L.A. in just under 50 minutes, and then having to spend nearly an hour inching along in gridlock on your way to the Santa Monica Pier. The Bridge would mean that travelers arriving at Union could connect to almost any part of the city within 15 minutes or less. Union Station would act as the heart of the Bridge system, with all Bridge cars making their way right past the MTA headquarters. Explore the proposed route in greater detail above. Introduce yourself and how you would like to be involved.